B. Text. Textile Plant Engineering1, B. Text. Fashion Technology2,D. K. T. E. Society’s Textile and Engineering Institute, Ichalkaranji-416 115 INDIA. To be successful in today’s demanding yarn market, modern spinning mill needs to be fully focused on performance and quality of ring frame. So controlling the performance of ring spinning has good potential in future to obtain international quality level yarn. Most of the spinners are in under the impression on that international quality means that all yarn quality specifications should be either equal to or better than USTER 25% values and they try very hard to attain that level by going good quality raw material and good machine performance. To analysis machine performance, the spinner is in a position to check 100% of the material produced which is only possible by online monitoring system called as RINGDATA. This paper broadly deals with an overview of the need, design of the system, working of the system, uses, comparison with old methods, modern technology and future growth in RINDATA (online monitoring system). Keywords Ultimo System, SpiderWEB, IMS, MMS. 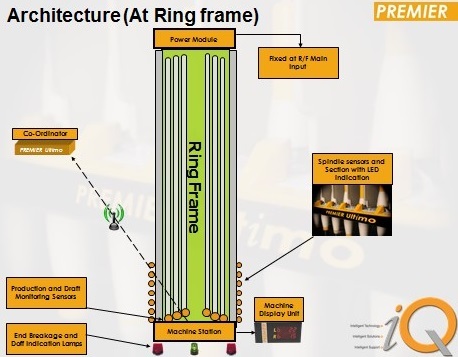 RINGDATA is an online monitoring system which assesses the performance of ring frame on the machine itself with the help of sensor and embedded electronics. This system enables to locate the faulty package and material. It is a powerful analysis tool allow instant identification of poor performing machine and spindles, resulting in faster reaction to problems and an increased efficiency and quality level with minimum efforts. By considering the need of online control most manufacturer provides embedded online monitoring system in ring frames itself like RIETER, LMW, KTTM, and others. Machine display provides information about production, end breakages, stop time, overall performance and power consumption of machine. In an olden day quality control is the offline type. That is sampling the material from different spindle or machine or count wise and then testing of it is carried out. Then by comparing testing result either with norms or customer requirement machine setting or other decision is taken. All this process of sampling, testing, analyzing and correcting action consumes more time with human error. All this is happening away from machine so-called offline monitoring system. Quality monitoring by trial and error is outdated as is quality assurance and control from the laboratory. So modern system approaches online monitoring on ring frame which will overcome drawbacks of offline monitoring. Modern and efficient is linked online with production process; continuous monitoring and optimization of the production process are desired factor for consistent quality. Complete quality monitoring provides information on raw material and machine parameter. Required extra laboratory with equipped with a modern testing instrument which increases cost. Sampling and testing are time-consuming and may add human error. Corrective action is taken by observing result which may wrong. Saving of testing result which may difficult due to paperwork. Calibration of the testing instrument in specific time should do which increase cost. Detaching and signaling ends down. Detaching and reciprocating ends down. Detaching and recording ends down. Detaching and analyzing ends down. Roving stop motion in the events of end down. Assessing spinning behavior of the raw material. Assessing production behavior of the machine. Establishing causes of faults, overall and per spindle. Operator guidance by proper signaling. In this system traveling sensor runs continuously back and forth at the height of ring rail of an each side of the machine on a single machine or all machines. This generates a magnetic field that is affected by the rapidly rotating traveler. If yarn breaks occur, traveler ceases to rotate and sensor display resulting impulse as an ends down, downtime and repaired time. Machine number, date, time, production period, spindle speed, yarn twist, output in kg or kg/spindle, efficiency, downtime, doffing time, ends down/1000 spindle hours and a number of the spindle with ends down exceeding this limit. In this system optical sensor on the ring frame at each spinning position, which is assessing the motion of traveler. Each spindle has an individual sensor which provides more control than MMS. More and more spinning operations want to monitor the individual ring spindle for yarn breaks and spindle speed. IMS, based on an individual optical sensor for each spindle, detects run/stop and speed, monitors the ends down level and reports slipping spindles. One mouse click on a particular ring frame allows the user to select any detailed report, such as spindles with the highest breakage level, slipping spindles per machine, yarn breaks as function of the bobbin build up, and during up and down movement of the ring rail, Stops are always assigned to the right spindle, regardless the length of the machine. Ends down levels, slipping spindles, and frame and spindle efficiency are reported by doffing, as well as by shift, day, week and month. Trend reports highlight recurring problem spindles. a. No moving parts in the system. b. No maintenance due to less moving parts. c. Continuous monitoring of all spindles. d. Each and every spindle is under in supervision and control. At one side of ring frame machine, the station is there, at other side power module is present as shown in the figure. Power module contains motor supply and gearing is available. Ring frame has spindle sensor and draft sensor they are internally connected in machine station. The software takes it as input and display on machine display unit. According to problems, bulb signal is provided which will helpful to the operator. End breakages and draft error signal were given on machine. Machine station is connected to co-coordinator. At each co-coordinator, 15 to 20 machines are connected. From machine production, number of breakages, efficiency, twist, spindle speed, yarn length on bobbin, count, twist variation, draft setting, maintenance setting, air pressure, roller speed, ring-rail speed, bobbin build-up doffing cycle, doffing time number of doff and power consumption all data given to co-coordinator through wire connections or wireless connections. Co-ordinate has data of 15-20 ring frame, it collects data from machine and store for some time and then given to network router. The network router is the main component in the system it stores data, display data, give data to server PC, client PC. Network router has a display to show all parameter. Client PC and supervisor PC has only displayed no any corrective action. The only owner as well as manager only can adjust parameter. Server PC connects to owner mobile, email to online storage data. All connections are either wireless or wired connections. All pcs are connected to printer from each report are printed according to time, shift, day, count, lot wise and client wise. All production parameter, machine setting, client order, twist setting and draft setting are stored on PC and server it can withdraw at any time. All production-related parameters are shown in this report. Productions are given in meter, kgs, and pounds, per shift and per day. All end breakages parameter is shown in this report. 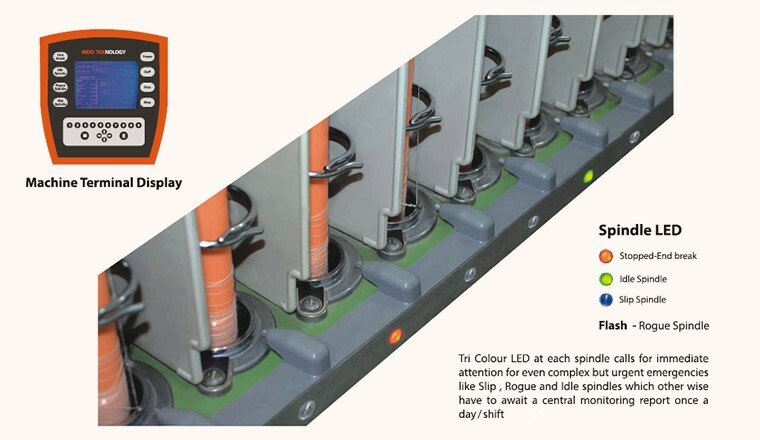 End breakages per hour, per shift, per day, per rail position, stop time, average end break is display. All machine stop parameter reasons behind stoppages of the machine. In report stop time, min/stop, doffing, doff%, min/doff, stop time per doff, stop per shift, stop per day are shown in stop report machine wise. All performance of machine related parameters is given in this in the report. In this report production in kg, production in pounds, twist per inch, twist per meter, doff per day, average ends down all parameter are shown. All power consumption is shown in this report. Power consumed by the main motor, pneumafill motor, E-draft motor, Ring Rail motor are combined and total power consumption is displayed. Power factor, power consumption in kW, kWh, and frequency are given. Automation in spinning is always an integral part of the old system, which will improve product quality. Automation in the spinningsystem always tries to achieve 100% efficiency, highest production, less human work, more control on the process with maintaining international quality yarn. Online quality monitoring on ring frame is itself a new development since in last decade. Now latest technology is trying to control system with using mobile and tablet by APP and data demand through messages request. The server of the system is connected to the web server. The server has stored data and ongoing production data. 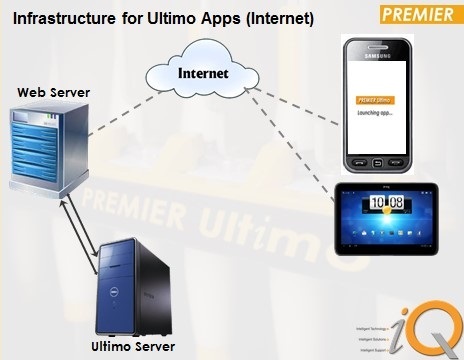 Web server is connected to the internet which will store data on the internet in protected manner. Mobile or tablet should have installed the app of that control system which can assess control system. Mobile owner or mill owner only can change machine or another setting. Only owner can see reports and all mill data or ring frame data. Now Rieter has developed android based mill control system with name SPIDER-WEB mill control. Spider web is modern user oriented windows based data system figure 6.6 shows the corresponding data flow the mill in schematic form within the mill this data flow is based on Ethernet. This both simplifies data management and enables data loss to be prevented efficiency. Data are stored in 3 locations for this purpose. a. On the machine, until is they are written onto the customer’s PC. b. On the hard disc of the host PC, until are written into Spiderweb database for up to one-year external backup. c. In the spider web database for up to one year. External backup of this database is possible. These systems mostly feature a three or four-level structure, starting at the lowest level, i.e. 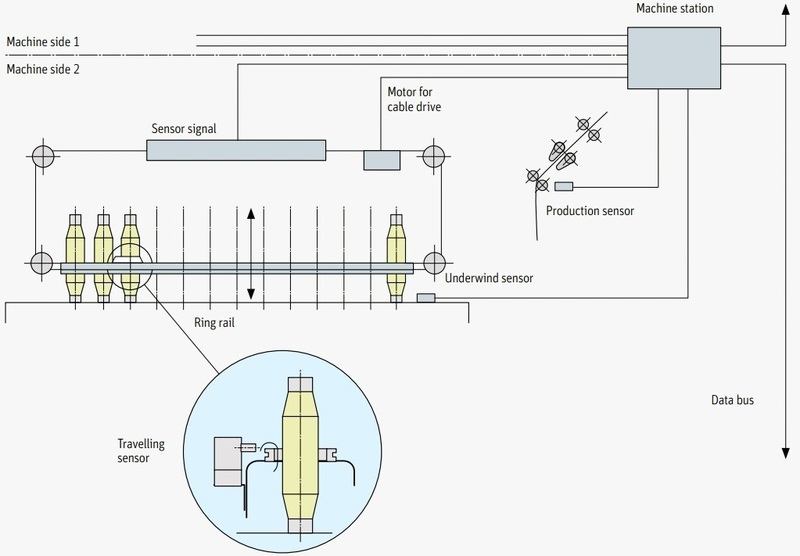 the level at which sensitive sensors are installed directly at special control points on the machines. They pick up the incoming figures and transmit them to the second level, the machine level. At the machine level, simple computers collect, transform and evaluate the signals arriving from the sensors. The summarized result is often indicated in a simple manner on a panel at the machine, informing the personnel responsible and enabling them to react immediately. 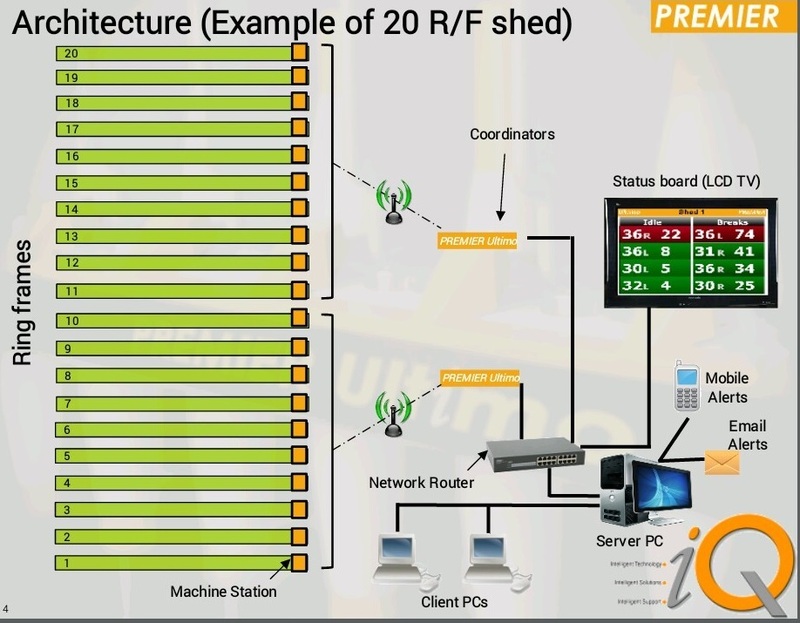 The third level is the level of the PC workstation, where the data collected at the machine level is selectively evaluated and informatively displayed in the supervisor‘s office, often also in graphic form. The top level of the MIS is usually a commercial host computer. Here again, all information arriving from the third (or perhaps second) level is collected in a condensed and compatible form by a local network and selectively evaluated in an easy-to-use form, The detailed analysis of the second, third and fourth level enables immediate action to be taken if the slightest deviation occurs. As the demand for yarn increasing due to more consumption of textiles it necessary that provides that much yarn to market without compromising on yarn quality. It is possible only when quality should maintain throughout the process. The spinning of yarn is important for yarn quality so by online monitoring at ring frame it can possible to maintain. Leading spinner is using embedded online monitoring system on ring frame. It provides the easy setting, easy working to the operator, data storages, less paperwork. As the demand of ring data increases number of research taken place in the system also increased in last decade. Beyond the online process control, man is trying control whole mill by smartphone. Controlling spinning by means of mobile has great potential in future controlling system ring frame. By this new ring data system working of the mill and highest quality of yarn is possible with high author security. 1. Sharma S.K., On- Line Quality Monitoring Systems in Spinning, sourced on 9thJanuary 2015. www.fibre2fashion.com. 3. Peters G., USTER® LABORATORY SYSTEM, Application Report Quality 4. Management in Spinning Laboratory, The standard from fiber to fabric, November 2003. 4. Spinning manual by W. Klein. 5. Indian journal of fiber and textile research vol.17 Dec. 1992. 6. Online Quality Monitoring in Spinning by Giriraj Goyal.